Founded in 1535 in Brescia the Company of St. Ursula soon spread out in the surrounding provinces. There was a remarkable growth in Milan in merit of St. Carlo Borromeo, but risked to be heartless in respect to its original form. In the period of the 16th century the Company spread out beyond Italy and in some places it was transformed into cloistered ursulines and religious congregations. Apparently the Company disappeared during the time of Napoleon; the Company reappeared again halfway the 18th century in merit of the Girelli sisters of Brescia and their Bishop Mons. Verzieri who took care to spread the Company in all Italy. On the 25th May 1958, accepting the exigencies of communion and collaboration of the Companies, the Holy See established and approved the Federation as a female Secular Institute of Pontifical right with a diocesan and interdiocesan organisation. With the passing of time the Company spread in many other states and continents. nt, also a beginning of change from the original form and the originality wanted by the Foundress. her bishops, on the example of St. Carlo Borromeo gave birth to the Company in their Diocese. In the first years of the 16th century an important turning point happened for the Company; its diffusion beyond Italy and its transformation in certain places to that of the Order of the cloistered Ursulines and eventually to various religious congregations. 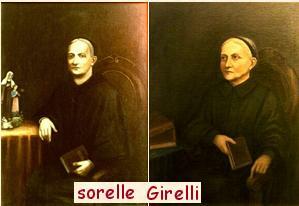 of Maddalena and Elisabetta Girelli of Brescia. They, through the determined help of the Bishop Mons. Girolamo Verzieri restored the merician institution in their own city and took care to spread it in all Italy and in other States. Very soon, were created spiritual bonds and collaboration among different Companies. Through them meetings among various leaders followed to reach a formal shared recognition of these bonds. In the years that followed we arrived in this way for the constitution of a Federation among Companies. Following the recognition on the part of the Church for Secular Institutes (1947, “Provida Mater”) the Companies after opportune sessions of deep reflections retained that their place among the Secular Institutes could be in synchrony with their Charism and with their tradition. On the 25th may 1958 the Federation of the Companies of St. Ursula as a Secular Institute of St. Angela Merici came to be recognized and its first Constitutions were approved. After the promulgation of the new Code of Canon law, in 1994 a renewal of the constitutions was necessary, also with the aim to apply the ever valid Rule of the Foundress in a changing historical and social context. By the passing of years the Company flourished in Italy as well as in the rest of the world. Today it is present in 40 Italian dioceses and in 20 other states: in Africa, America, Asia and Europe. Truly we can say that from one sole trunk were born many branches.